Do you need an old car? 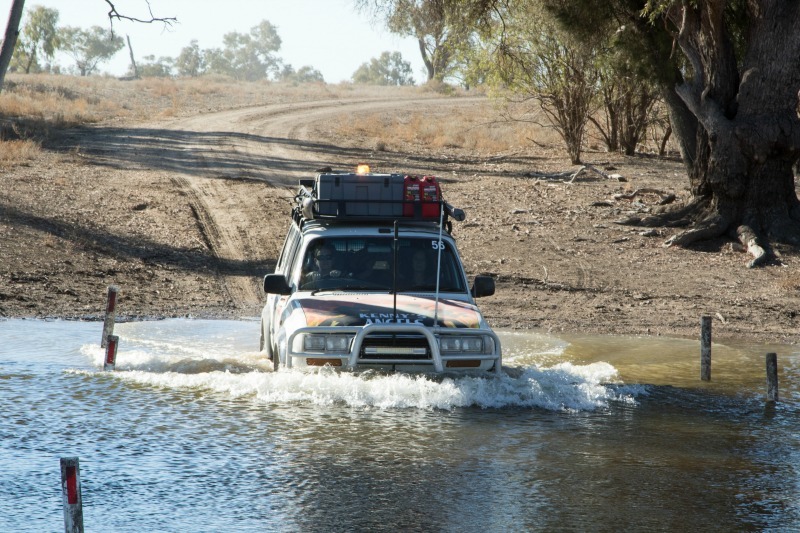 But I don’t have a 4WD…. We chose a 4WD as our car for ease and comfort, but there were just as many 2WD cards on the rally. There are also two courses – the rally course (which we did) and a road course for vehicles more suited to smoother tracks. Les and the famous Flying Peanut is a veteran road trip car. Believe me, when our alternator cracked the shirts on the day before we left, I was worried about what would happen should we break down too. But the thing is, no one is left behind on the Rally. 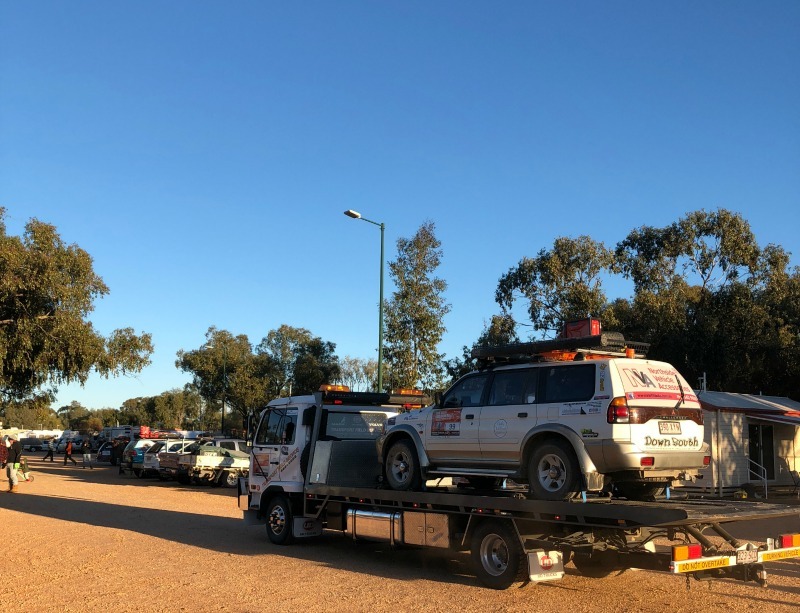 The cars that did have mechanical difficulties were towed by the Rally’s own tow truck (Towstar) to the next town. From there, if the problem was something the Army Mechanics could solve, the cars were fixed overnight – seriously, it’s like a mechanical version of the old “Elves and the Shoemaker” story, except the elves are massive and wear army greens! If the problem proved too big for the Army’s Mechanical Elves, the crews found local mechanics to patch them up and the Rally Team made arrangements for them to catch up to us. Car 99 heads to the mechanic atop of the Rally’s dedicated tow truck, Towstar. In 2018 the minimum fundraising pledge was $3300. The vehicle entry fee was $330 in 2018. The individual fee was $850 per person. This included all our tucker plus a night in a lovely warm dorm! No. 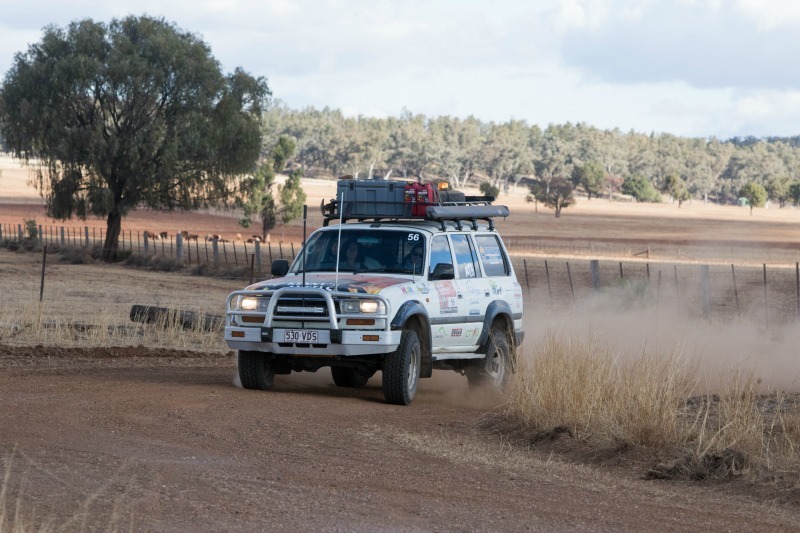 The tracks are graded in terms of difficulty but our car managed without any worries. Sure, I put our most experienced driver in the seat for the really hairy stuff but the tracks were good and there was always someone on the two way should we have run into difficulty. The Rally also uses a really clever bit of technology called RallySafe. It’s effectively a GPS beacon fitted to each car. Vehicles can then be tracked and messages relayed via satellite. Because of this extra layer of safety, the Great Endeavour Rally gets to travel some remote and rugged stages that other rallies can’t. Do I need good tyres? There were a number of times during rocky stages of the 2018 Rally, when we were grateful to our sponsor for our four shiny new tyres. Could you do it without good tyres? Probably. Would you have spent time in the dust and prickles on the side of the road changing tyres? Most definitely! Participants and vehicles of all ages and abilities are welcome. Plenty. In all honesty, we had more fun last year than we expected. We knew we’d enjoy it, but we were really happily surprised by how much fun the other teams were. I also really enjoyed waking up each morning, not really knowing what the day would hold. I saw parts of Australia that I’d never seen – or knew I wanted to see – and I’m so thrilled I did. We travelled with a swag each. Other teams slept in the back of their cars. 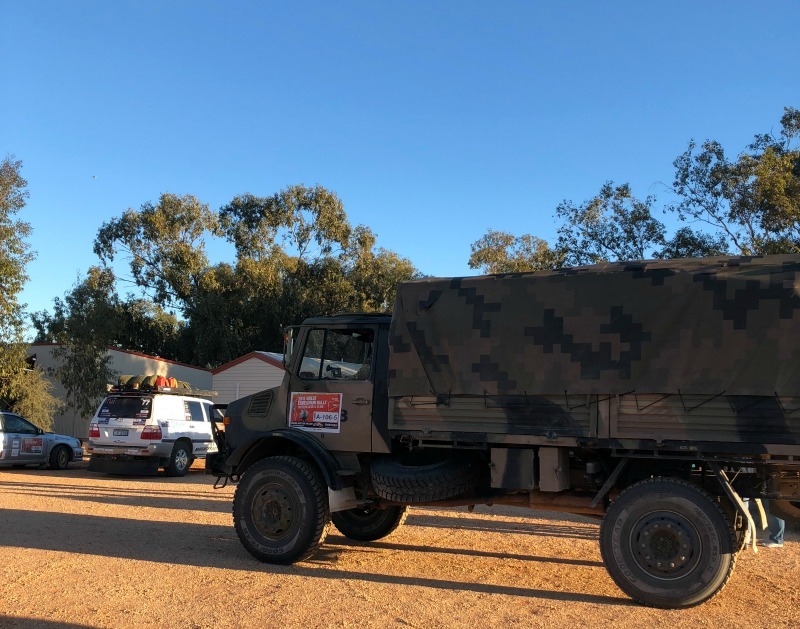 The Army send a “Spares Truck” along for the ride, we were able to send our swags and one of our spare tyres to the next stop in their truck, so they didn’t get dusty during the day. I don’t know anything about fixing cars? That makes two of us! I’m pleased to say that we only lifted the bonnet to do some basic maintenance each morning. We checked the oil, topped up the brake fluid and cleaned the air filter a couple of times, but apart from that we were putting all our faith into the Army and a few of our better qualified Rally mates. Soni gives the air filter a clean while the Army Elves look on uncomfortably. So that’s about all of the questions we’ve been asked about the Rally.